Retirement investing is different from other investment objectives and need to be treated specially due to its great importance. In order to lead a happy retired life, you need to keep away from these mistakes to build your perfect retirement portfolio. “Retirement is wonderful if you have two essentials - much to live on and much to live for.” - Author Unknown For many of us who are in the prime of their life, retirement is a far-away thing. It is often put off and not really much thought about. We have the approach that once we retire, things will go the way we want and everything will fall in its place automatically. But more often than not, it doesn’t happen the way we think or wish for. Life is precarious, you never really know where you would be tomorrow, forget about 30 years from now! But, many a times we ourselves land in trouble, not because of the uncertainties of life but because of our own mistakes and miscalculations. We all wish for a retired life that is full of relaxation, mental peace, travelling around and doing things we really enjoy. But it isn’t that easy unless you have an appropriate pension plan that suits your needs and requirements. Let us take a look at the common mistakes in investing for retirement and how to fix them. The most common mistake made by many is not having a plan for their retirement. When you fail to plan it simply means you plan to fail. Though there is not really any formula that can help you make a fool-proof pension plan but saving on a regular basis can safeguard your sunset years. Most financial experts suggest that an individual must aim for at least 80% of his salary or income for the time he retires. For example, if you are earning INR 75,000 today, you must aim for INR 60,000 when you retire. Starting your investment early is probably the golden rule for a pension plan as time is the most valuable asset that you have when it comes to choosing the best investment plan. However, there are many who think that there is plenty of time in hand and thus they keep putting off their pension plans. When you start saving early you give your money time to grow. No matter how difficult it may seem, but there is no better time to start investing than today. The more you delay, the more difficult it would become, and the more at risk you would be. One of the biggest things to cater for in your pension plan is medical expenses. Not doing so timely, can turn out to be one of the most fatal mistakes you make when investing in a pension plan. Not only you are under the risk of being unwell without any medical cover, but you may also end up paying a higher premium simply because you plan to buy a health plan after or close to your retirement. Even the best investment plans may not prove to be very helpful if you do not know how much you need to save. Believe it or not, there is not going to be a change in your lifestyle overnight, neither are your expenses going to decrease manifold. Therefore, save enough so that tomorrow you don’t have to cut corners. Apart from your lifestyle and everyday expenses, as discussed above, you need to be well-prepared for an emergency without being much worried about the financial implications of the crisis that has risen. Hence it becomes very essential to know how much you would need to save today so that you can have a comfortably sustained life in future. Thinking that things will settle down on their own is a mistake that we tend to make. Another such mistake is thinking at the age of 30-40 years that you will continue to work till you are 70. As you grow older, your health and energy levels deteriorate. What used to be an easy and fast job at the age of 30 would not be the same at the age of 60. You may continue to work part-time or find a new hobby when you retire, but your retirement is not going to bring you any hidden surprises, so be realistic and select a pension plan prudently. Putting all the eggs in one basket can sabotage the pension plan that you have. According to financial experts, rather than fixating on the best investment plan there must be a variety of good investment products. For instance, putting a lot of money into an annuity plan is not recommended. There is no denying of the benefits of a life-long pension plan but then the returns offered by an annuity plan are far too low to beat the rate at which inflation is constantly increasing. There are some schemes by the government which provide annual returns that can easily go up to 8.7%. Systematic Withdrawal Plan (SWP) from mutual funds offer even better returns. It won’t be wrong to call inflation the most disastrous tax ever. Many of us while planning for the future may forget catering to the effect of inflation on our savings. Let us suppose, at present for running your everyday expenses you need INR 50,000. In six years, inflation at 6% would increase that amount to INR 70,000, whereas in 25 years your household expenses will reach around INR 2 lakh a month. Not taking inflation into account can, therefore, have serious repercussions. It is often said, if you save money, money will save you. This is exactly the case with having the right pension plan. The best investment plan will not only make you invest systematically but would also give you a comfortable life once you retire. All your life you have worked hard for your parents, partner and children, so your retirement should be a time when you too can sit back and relax. Therefore, invest in a good pension plan today, if you haven’t already. “Retirement is not the end of the road. It is the beginning of the open highway.” Be sure you have the right plan to make things work and avoid the mistakes mentioned above. 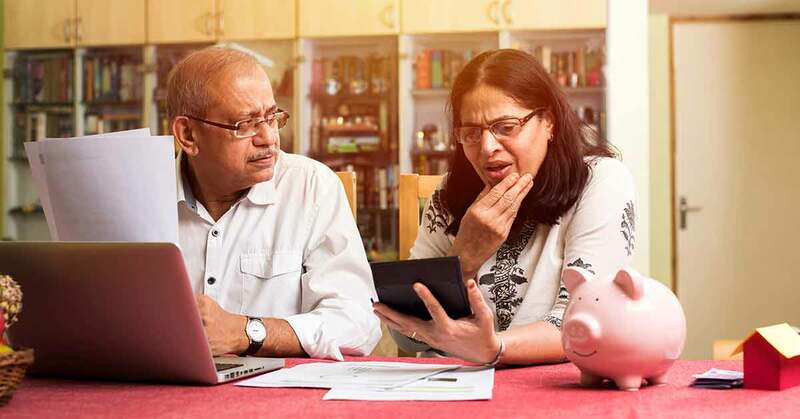 Recommended Read: How to choose the best pension plan in India?